I was at the Knitting and Stitching Show at London Olympia last Friday and I promised friends I’d do a little summing up of my favourite things. One day just didn’t give me quite enough time to see and do everything! I didn’t get to see any of the Live Theatre or do any Workshops. Next time I will book for two days and plan more. To start with, I was enthralled by the Quilters Guild exhibition of Modern Samplers . Just a few snaps, only three quilts of many. I was restrained with my purchases, possibly that’s another reason to go for two days next time! I found a wonderful button maker! I bought beautiful fabric to make a summer dress and a pair of beach pyjamas. You can’t tell here but the the cherry one is cotton and the jade a gorgeous cotton/silk mix. Then there’s a kit to learn how to adjust standard dressmaking patterns. Having struggled to make things fit me perfectly I hope this helps in future. Wish me luck with a lot of reading before the measuring begins. I’m also going to make a little fabric trinket bowl – or maybe two or three! There were lots of lovely yarn sellers including independent dyers and spinners. I squished and admired and took business cards for future delights. I can hardly believe I had enough self control not to buy from each and every one of them on the day. Yarn is usually my downfall and I often go home with bags full! There was a sweet knitted display called ‘The Enchanted Wood’, fairies and woodland creatures of all sorts. Donations were being collected for the Louise Hamilton Trust, a charity founded by the family of a young woman who died at an early age from Breast Cancer. The display must have been fun to make, these pictures are a small part just so you can get an idea of what it was all about. Lastly, and sadly too, the exhibition of Dame Zandra Rhodes knitwear was a little small and poorly located (no pics). It was a shame as she only designed knitwear for the 15 years she had a shop off Bond Street and she is a great admirer of knitting skills. I can’t say what I saw inspired me to knit anything similar – imagine 1980’s picture jumpers in blacks and reds, however I think the exhibition company could have made more of this exhibit. There was so much more to show you, just wish you could have seen for yourselves. If you did go, please share too! This entry was posted in Uncategorized and tagged buttons, fabric, knit, knitwear, quilt, sewing, Zandra Rhodes. I have been truly wiped out with a heck of a cold for the last couple of weeks so knitting, crafting and blogging has taken a back seat. Sadly this even included my birthday and all the plans I had surrounding it – so things got cancelled and reworked and put off. On top of this hubby has gone off for a two week business trip (after my birthday, he was here for that at least) – so no-one’s been home to make me hot lemon and honey and generally fuss (he might think this a good thing!). Thank goodness for the bolstering of good friends, I thank you, you know who you are. So at last I am almost back to feeling ticketty-boo (quoting from a 2001 film I caught yesterday! *) and I am almost back to crafting too so you may see more from me on here over the next couple of weeks. Today I started a child’s sparkly bolero, the yarn sparkles and the sunshine does too. Yarn from my stash. When unwell knitting patterns and yarn would not play ball. Thank goodness I’d just finished the last hat I was making but it went off to it’s new home without a photo snapped. So today picking needles back up I am not nagging myself that I should be returning to a larger half-done project and using part of my stash means I can restock sooner. The Great British Sewing Bee is back on TV as well so at least there has been some sewing inspiration albeit no sewing action. Who else has been admiring the contestants progress? Will anyone guess who might win overall? I know it’s early days but … I am already thinking Leah or Jen. It was sad to see Ben go but maybe his talents lie in fabric design rather than fabric manipulation? Just my opinion, I am no expert and enjoy the show as entertainment only. *2001 Film, Crush with Andie McDowell, incredibly girly film. I realised I was watching the outfits just as much as the story. How I wish I could sew better and I would love to try a bit of millinery one day. This entry was posted in Uncategorized and tagged Great British Sewing Bee, sewing, yar. Here are two more chunky hats knitted for a local homeless charity I can not donate time to the cause but I can donate craft and a hat is whipped up in two or three knitting sessions. It’s good for the soul to give something back in any way I can. I admire those who do more. This hat making is helping me clear some of my yarn stash too so it’s a win-win situation. There’s a lot in the media right now about clearing and cleaning your life which seems to involve sorting out and tidying up and getting rid of things that don’t spark joy aka Marie Kondo styling. This yarn is lovely, nice colours, great to knit with (Adriafil Mistero) but it wasn’t making me smile a lot as it’s left from previous projects and there was never enough to do anything bigger. It was languishing in a cupboard. I am so glad to have re-found it and hopefully it will spark joy for someone else in more than one way. However …. as much as I am enjoying the hat making I know I am putting off other things, including finishing knitting and sewing larger projects. It is very satisfying to see something grow quickly and then be gifted. I am talking about my recent baby knits and quick projects. This morning I looked at a few half done/three quarters done/tangled/mistaken projects in my craft room. I looked, then ‘hid’ them from myself until another day. I am wondering if it’s not just my crafting that is being avoided. For now, it’s time to cast on again. I am thinking this is almost my own version of ‘taking a basket weaving class’ with a slightly more fulfilling end. This entry was posted in Uncategorized and tagged craft, knit, Marie Kondo, sewing, smile. Lovely readers know I adore bunting and beach huts. Recently I blogged about both. I had made some bunting to donate to a friend for a charity event. I used cotton fabric from my fabric stash which I’d been holding onto for something special. I loved it so much it was almost difficult to gift it! Therefore I made another length for myself. We’ve just been away to France for a few days. We had glorious sunshine, mostly. Here’s my bunting, in situ, decorating the outside of our house in France! Houlgate has this great line of beach huts, each year reconstructed on the promenade. I often wonder where they go for the winter. This year we were there when workmen were putting together the last few and lining them all up ready for their summer use. They are numbered, some are named and even though I have been visiting for more than ten years I have never counted how many there are. In this photo the last one is number 154 ! Some numbers are missing, some are in better condition than others, but they are all orange and white stripes. Knitting and sewing is high on the agenda at the moment but so is getting a little bronzed ! Where do you like to knit if you get the chance? This entry was posted in Uncategorized and tagged crafting., France, Houlgate, knit, sewing. A little quilting … bit of a faff this time! Very little crafting indeed this week. It’s been a quiet week craftwise, with much time taken up elsewhere with family illness and a little bit of work. A few weeks ago I began a machine stitched baby playmat. I kept the urge back to post pics here as I was planning to post when it was finished. I briefly worked on the playmat two days ago, a little time for me and for my sanity! I still have a little way to go – craftwise that it, sanity well who can tell! The playmat was supposed to be a quick and easy project. A few weeks ago, the piecing went well, fabulous fabric donated by a friend. I pieced the front, THEN I accidently cut the backing too small! Grrr, I dashed out and purchased an alternative fabric. I sewed the back and front together like a pillowcase, intending to pop in the wadding and simply do some formed of ‘tied’ quilting. That’s where I had left it until this week. So what’s a magazine got to do with quilting? There are no sewing patterns in this one …. Have you ever tried to insert wadding through a small gap in one side of a pillowcase shape and try and make it reach all the edges? It doesn’t work – wadding is way too flexible. It clung to the fabric in all the wrong places. I had imagined it would be like putting a duvet in a duvet cover. It isn’t! I ended up flipping the ‘pillowcase’ inside out again and attempted to tack the wadding to the wrong side of the front of the playmat. There was one major hurdle – I had to avoid tacking the wadding to both the front and the back as I then wanted to flip it right side out, seam the gap and then tie the quilt as planned. Some might say ‘why didn’t she just undo the seam around the whole thing and tack the wadding to one part?’ I have no idea why I didn’t do that! So, this wasn’t like a standard quilt where you have three layers and then bind the edges afterwards. I came up with this weird method of inserting a magazine into the gap and moving it beneath each part as I tacked. I could pin and tack through the wadding and the front without the pins and stitches going right through to the other layer. Here’s a pic mid process with a hint of what the back will look like. A touch of dotty blue makes the back a calm colour . What colours do you think the top will be? I shall finish this before the recipient arrives in June. I had just run out of me time this week and was slightly traumatised by the effort this took! Watch this blog for the finished article. Total other craftings this week – three hexagon shapes cut and tacked to card for my hand quilted hexi project. Long way to go on this one. Twelve rows of knitting, shaping armholes for an ongoing project. Not so much to still do, the bulk is done. I am just at the fiddly parts, not a project to take when hospital visiting. I have a new one for just that next time. This entry was posted in Uncategorized and tagged knitting, quilt, quilting, sewing, stitch. Hexagon heaven – a little quilt in progress, and a knit fail! I have been crafting steadily over the last few days but there’s not a lot to photograph and show off! Here are my latest 19 hexagons handsewn together. Excuse the crinkles – it’s a moveable project and it came with me to a craft club last night – obviously not packed so nicely for it’s journey home! Might have been due to exhaustion – second day in new job, followed by an evening at a craft club with just an hour between the two. I might have overstretched myself too far yesterday, though the stitches are even so at least that wasn’t a consequence! Recently I posted a pic of this sofa quilt project. Eventually all my hexagons will be sewn together and what started as a cushion project WILL become a throw for my spare sofa. I am calling it my organic project. I started it several years ago, have dipped in and out but am currently working away on it, using fabric from my stash and adding more if I come across something complementary when out and about. I may purchase a FQ or a half metre or more at a time, not exactly planning what I need at all. I am a ‘wing it’ sort of girl and this is a lot of fun. I am not stressing at all about how long it might take me and if another project becomes a priority it won’t matter at all. There’s a lot of love being stitched into this. Hand sewing is very therapeutic, and each stitching session is really enjoyable. This is not detracting from the two knitting projects next to my sofa, nor the machine stitched quilt almost finished on my work table. 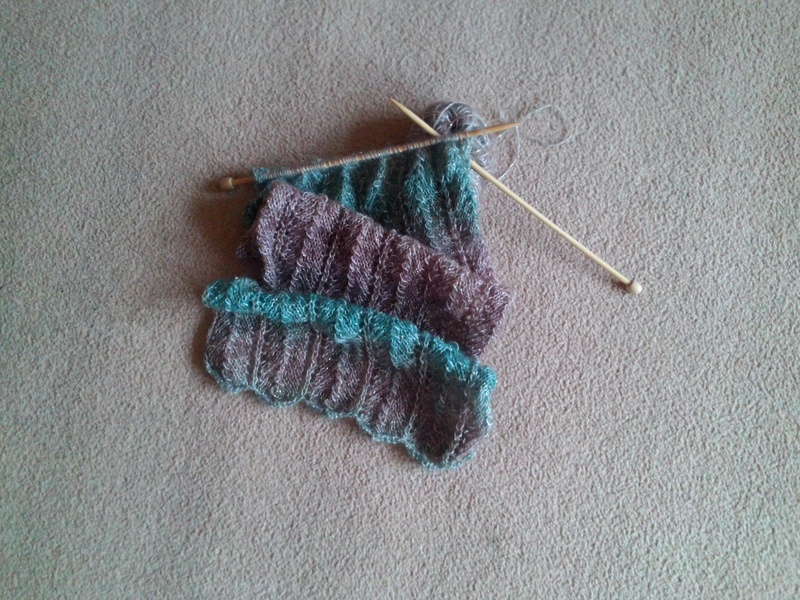 Knitting-wise, I have just picked up stitches twice (yes, twice!) around the neck of my latest cotton top. Unfortunately the first pick up was very uneven so I undid it. The second pick up has been better but there are still a couple of places I am not happy with. It has been relegated to it’s knitting bag for the rest of the day. Sometimes a project ‘works’ first time, but sometimes it doesn’t. Often when I go back to it everything clicks and that’s the project for the day but today is a knit-no-more day. No pics of the wonky pick up – too embarrassed to show that off – I may have to enhance the neckline to make it wearable. Would love to hear which online yarn and fabric suppliers fellow crafters use. To start, one UK fabric online shop I love is ElephantInMyHandbag.com – lots to like on here. I do actually visit shops too. My hubby says I can sniff out a yarn or fabric shop from miles away – luckily he can be a patient man whilst I shop, or at least he ‘sniffs out’ a pub nearby and pops there whilst he’s waiting! This entry was posted in Uncategorized and tagged elephantinmyhandbag.com, FQ, hexagon, knitting, loveknitting.com, quilting, sewing, shop.